Hundreds of thousands of people have profited from the wisdom and savvy of Lead the Field. In fact, it has often been referred to as the "Program of Presidents" because so many top executives have incorporated Earl's guidance and wisdom into their management philosophies. When you listen to this landmark program you'll be awestruck by the simplicity and timelessness of Earl's words and ideas. Lead the Field has arguably changed more lives and created more millionaires than any other program-start moving into the top 5% of the world's earners!! 8  How Much Are You Worth? As a Depression-era child, Earl Nightingale was hungry for knowledge. From the time he was a young boy, he would frequent the Long Beach Public Library in California, searching for the answer to the question, "How can a person, starting from scratch, who has no particular advantage in the world, reach the goals that he feels are important to him, and by so doing, make a major contribution to others?" His desire to find an answer, coupled with his natural curiosity about the world and its workings spurred him to become one of the world's foremost experts on success and what makes people successful. 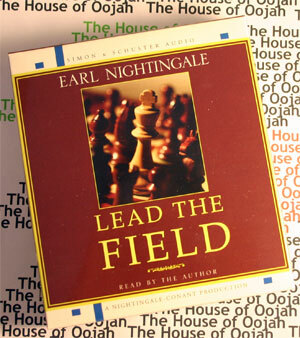 Earl Nightingale's early career began when, as a member of the Marine Corps, he volunteered to work at a local radio station as an announcer. The Marines also gave him a chance to travel, although he only got as far as Hawaii when the Japanese attacked Pearl Harbor in 1941. Earl managed to be one of the few survivors aboard the battleship Arizona. After five more years in the service, Earl and his wife moved first to Phoenix then Chicago to build what was to be a very fruitful career in network radio. As the host of his own daily commentary program on WGN, Earl Nightingale arranged a deal that also gave him a commission on his own advertising sales. By 1957, he was so successful, he decided to retire at the age of 35. In the meantime, Earl had bought his own insurance company and had spent many hours motivating its sales force to greater accomplishments. When he decided to go on vacation for an extended period of time, his sales manager begged him to put his inspirational words on record. The result later became the recording entitled The Strangest Secret, the first spoken word message to win a Gold Record by selling over a million copies. which eventually grew to become a multi-million dollar giant in the self-improvement field. They also developed a syndicated, 5-minute daily radio program, Our Changing World, which became the longest-running, most widely syndicated show in radio. the country on his radio program with the words, "The sonorous voice of the nightingale was stilled." In the words of his good friend and commercial announcer, Steve King, "Earl Nightingale never let a day go by that he didn't learn something new and, in turn, pass it on to others. It was his consuming passion." "You become what you think about." "What's going on in the inside shows on the outside." "Creativity is a natural extension of our enthusiasm." You are, at this moment, standing, right in the middle of your own "acres of diamonds."